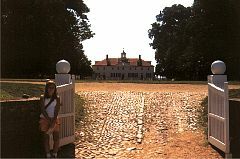 We drove out to George Washington's Mount Vernon about 8:30 on Wednesday, August 22. It isn't a very long drive from Falls Church Virginia. We got there just as it opened. No crowds: we were practically the first ones there. That changed in a hour - get there early. 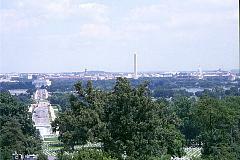 Here is the view of Mount Vernon, named for the British commanding officer of George's older brother. The most interesting thing I saw at the house was that the key to the destroyed Bastille fortress in Paris, France. It was sent to Washington by the Marquise de Lafayette to announce that like the Americans, the French had found freedom. It now hangs in the hallway of Mount Vernon. Mind boggling. 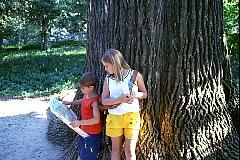 Here are two of my children standing by an elm tree that was a sapling when George Washington lived at Mount Vernon - he would have passed by it every time he took the drive which leads to the front of the house, which is off to the left in the first picture. No photography is allowed in the house. Here is the tomb of George and Martha Washington. 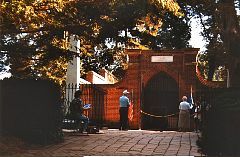 You can see Washington's remains which are contained in the stone vault just inside the gate. 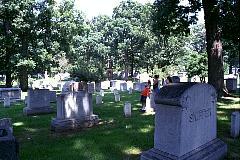 After visiting Mount Vernon we drove back to Washington to visit Arlington National Cemetery. 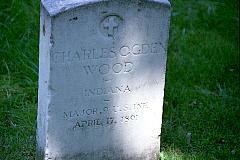 Charles Wood, the adopted father of my great grandfather, is buried in Arlington. Because of this fact, we were giving a pass and allowed to drive into the cemetery. Charles Wood is buried in an older, very nice section. It was hard to figure out from the numbering system where he was, but soon one of the girls discovered she was standing right next to it. We toured the home of Robert E. Lee, whose former home is the site of Arlington. To punish him, during the Civil War the Union began burying its dead on his estate. He gained ownership of it by virtue of his marriage to Mary Custis, a relative of George Washington. This picture is the view from the grounds near Lee's house. Just below us is the grave of President Kennedy.